As you know, I started my weight loss journey a little before the start of 2013. And as many people tend to do, I have totally fallen out of it. Many things came up -- I got my job in late December, I moved out of my parents house in April, and I started going back to school in June. Of course, there really is no excuse for not even doing a minute-long plank every day. Thus, I am so ready to get my mojo back! Now, normally, at the beginning of your weight loss journey, you have a reason to do it. Whether you have a wedding coming up, it’s almost summer, or the plain and simple fact that you don’t like the way you look, you are definitely motivated for the first couple workouts! I don’t know how people just get up at six in the morning and go for a 5-mile run before work, but I hope, one day, I could do that if I wished. That’s my motivation for working out (plus, in actuality, I look horrid in a two-piece). So, without further adieu, here is a list of my daily motivation go-to’s! The fastest way for me to get motivated is Pinterest. There are tons of different workouts, some sound so easy it’s almost impossible to say no. The biggest reason Pinterest motivates me is because when I’m looking through Health & Fitness pins, I see all the women who do workout and have amazingly toned body’s. After that, I look at myself and think: Do I seriously want to look like this? And if you hadn’t guessed, the A to that Q is a big fat no. Set goals. This might sound obvious, but many people just think about what they want to do and just “wing it” when it’s time to workout. You need to set a goal. 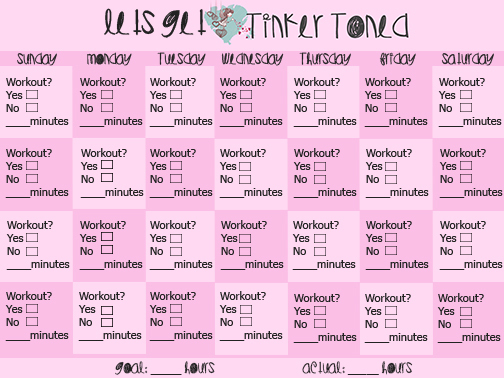 I use a custom calendar and write my workout goal for the month in hours. Then I have a section each day to write if and how long I work out. If I make my goal at the end of the month, I treat myself to a new shirt or jeans (hopefully soon it will be a swimsuit!) If you need a little help getting started, I’ve posted my calendar at the bottom of this post. My only request if you use it is to write your goals in pen–no cheating! Another way to find motivation to workout is to publicly post your goals — I do that through my blog. If you don’t have a blog, post your goals on Facebook, Twitter, or even just tell all of your friends! Once you have publicly committed to losing weight, it will be easier for you to want to workout. Lets say you post a Facebook status saying, “Today I start my journey, I plan to lose 20 pounds in 4 months!” and then you fall out of your weight loss a month later. A couple weeks pass and your (more fit) friend asks how much you have lost in the last month. How hard is it going to be for you to tell her you quit?